WINTER BREAK CHALLENGE: Students have been given their winter break challenges. They can pick and choose what they would like to do from the worksheet in order to get their challenge belts. How to use Music Theory.net! Click HERE to go directly to the note trainer on musictheory.net!! 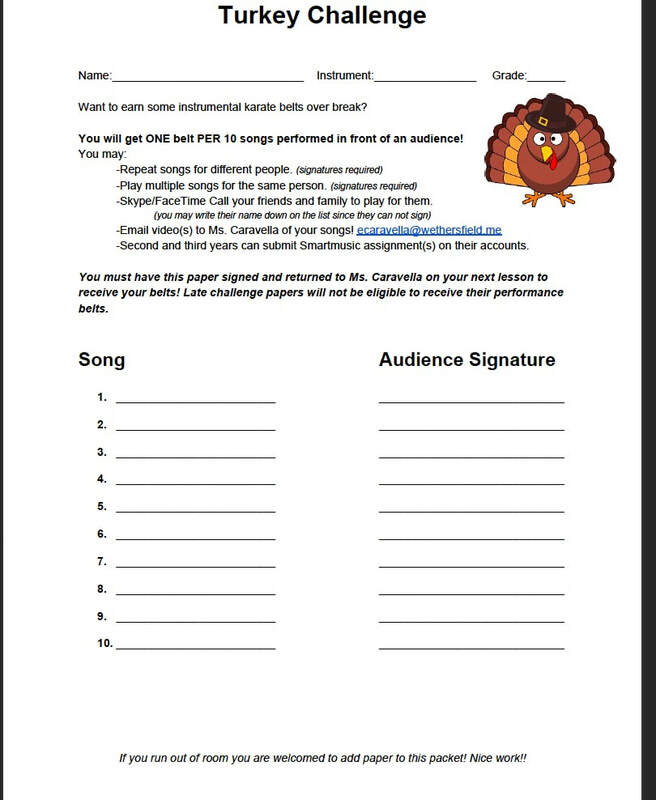 All Musicians have been sent home with their Turkey Challenges! Our current "World" (Emerson) Record is 36 belts earned! Good Luck and Happy Thanksgiving Everyone! First Year Strings: BOW LICENSE!!! Super busy day at the Orchestra DMV. All first year string students got their Bow License today!!!! Event: The Hartt School Viola Ensemble: Holiday Cookie Sing-a-long! Location: The Hartt School, University of Hartford 200 Bloomfield Ave Hartford. Please note: Parents are responsible for transportation and student supervision for the entire event. Runtime will be about 1 hour. I will be involved in the performance so students will sit with their families until they are needed to come up to the front to sing. Let Ms. Caravella know ASAP if you are able to make the event and want to sing in "The Grinch"! All are welcomed to attend to enjoy the show! The second and third year students are working hard to practice carefully and keep a steady beat. One practice tool they can use to do this is called a "Metronome" it is available FREE on google, app stores and even smartmusic. The metronome keeps a steady beat for you so you can practice with it. We watched this AMAZING piano player as well - he keeps a steady beat with his foot on the piano. The students would like you to note: this piano has been specifically altered to handle his foot doing this - doing this foot technique on a "normal" piano would break it. It is a super cool piece and we wanted you to enjoy it as well!